Thanhouser Career Synopsis: Lawrence Williams was a cameraman with Thanhouser, intermittently circa 1912-1916. Biographical Notes: Lawrence E. Williams was born in Pennsylvania on May 24, 1889. He was a cameraman at Thanhouser intermittently circa 1912-1916 and photographed films, as well as still and publicity subjects. Like other cameramen of his time, he was rarely mentioned in credits, therefore only a small amount of his work can be identified today. Williams was among those in attendance at the Thanhouser employees' picnic on September 7, 1912. At one time during his tenure with Thanhouser he also did work for other companies in the Mutual Film Corporation, including Reliance. The New Rochelle Pioneer, May 16, 1914, printed this item: "L. Williams, cameraman for the Thanhouser Film Corporation, is going to the Reliance Motion Picture Company of New York, and will soon take a long journey." In or shortly after 1914 he was the first to use a stereoscopic system perfected by Gerald Badgley (to whom refer), using it in a Pathé camera to film Mary Pickford in a Famous Players production (according to recollections by Gerald Badgley published in the Fall-Winter 1967 issue of Classic Film Collector). In January 1915, The New Rochelle Pioneer carried several stories on Williams, noting that he was going to California to do work for Box Office Attractions (Fox). The January 16th issue stated that "Lawrence Williams is back at the studio for a week behind the cameras prior to his departure for California, where he goes with a new company." For part of 1915 he was with Famous Players, where he worked with his brother on various films, including Rags, starring Mary Pickford. In early 1916 he was a cameraman at Thanhouser's Jacksonville studio, where he worked with Director George Foster Platt. Following the death of his brother Emmett on April 28, 1916, Lawrence Williams went to Famous Players to take his brother's position there. 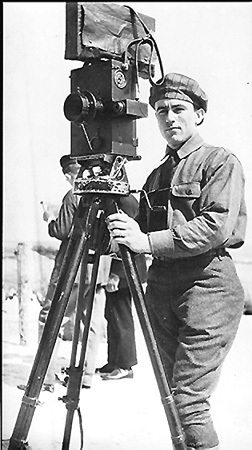 The Florida Metropolis, May 20, 1916, carried this item: "Lawrence Williams, cameraman for Claude Cooper at the Thanhouser studio, left yesterday for New York, where he has accepted a position with the Famous Players Company. Lawrence will take the position formerly held by his brother, Emmett Williams, who died recently in New York. His brother was the favorite cameraman of Mary Pickford, and Lawrence is to be commended on his record established in the movie game in this city. We are sorry to see him leave Jacksonville, but have hopes that Miss Pickford's company of Famous Players will soon come this way and bring him with them." His work with Famous Players included Little Lady Eileen, The Traveling Salesman, and other films, after which he was with Harry Rapf (The Struggle Everlasting). In 1916 and 1917 his home address was 51 Walnut Street, New Rochelle. In 1916 his studio address was care of Famous Players, 130 West 56th Street, New York City. In 1917 he photographed Broadway Jones for Artcraft. From January through April 1920 he was with the Supreme Picture Company. He died in Hollywood, California on March 30, 1956. In the 1980s his son gave a collection of his father's stills, including prints of Thanhouser film scenes, to the American Museum of the Moving Image, Astoria, New York.